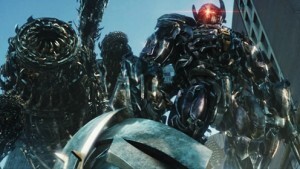 ‘Transformers: Dark of the Moon’ has been a surprising film. While many of us may share a common hostility to the movie and its explosion loving director, there is no question that most people ignore our opinions. They don’t seem to share our appreciation of the toys or heed the reviews from film critics. It may stick in the throat, but we have to say that the production with the silly title has proved a good many of us wrong. A learned film critic once pointed out that the ‘Transformers: Dark Side of the Moon’ might have been a better title. However, it would have led people to compare it (unfavourably) with the Pink Floyd album. The critic went on to complain about the lack of characterisation, ideas and interest. As true Transformers fans, many of us recognise these flaws in almost all the work of Michael Bay (The Rock aside). However, we should pause for a moment. The film has been nominated for three Academy Awards, albeit in technical categories. It could win an Oscar for Best Sound Editing, Best Sound Mixing and Best Visual Effects. Nobody can plausibly say such a result is undeserved. When it comes to the box office, us critics have to shut up. Box Office Mojo has confirmed that the movie was responsible for the largest part of Paramount’s $1.96 billion takings last year. It is easy to be snobby about a somewhat unimaginative action movie. It is simple to underline some of the things which the long film lacked. Nevertheless, we couldn’t make a film which would take more than $1.1 billion at the box office. They don’t make many statues for critics, or fans, sadly.